The original Ford Taurus SHO generated a loyal following of owners and enthusiasts, with an active club more than 1,000 members strong, an online forum with more than 10,000 registered users and a Web site (bringbackthesho.com) specifically devoted to convincing Ford to resurrect the SHO. 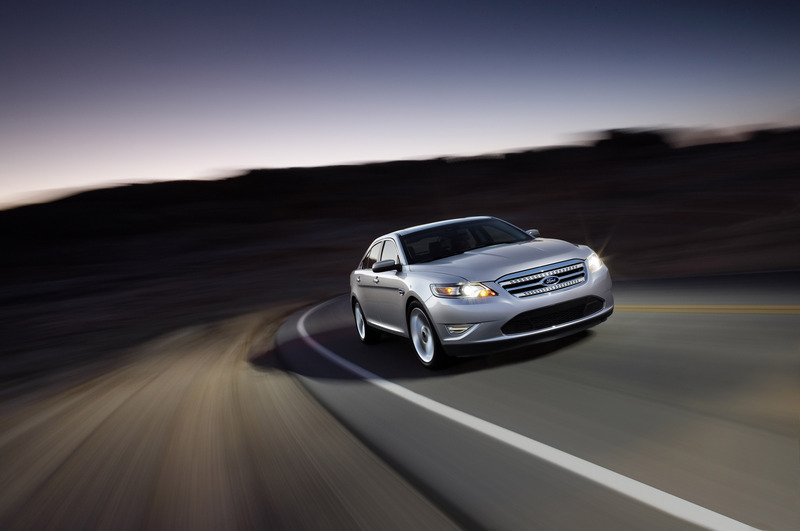 The 2010 Ford Taurus product development team spent significant time listening to SHO enthusiasts. 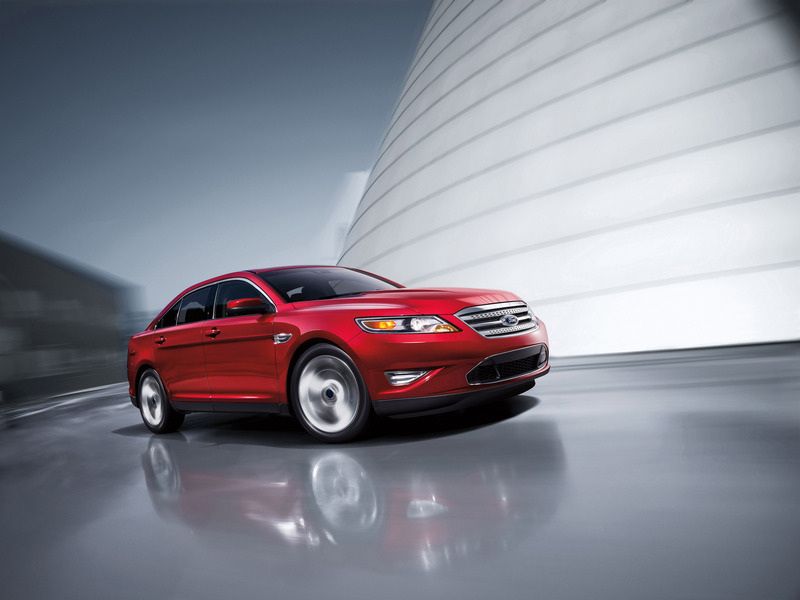 The foundation of the new 2010 Taurus SHO is a 3.5-liter twin-turbocharged EcoBoost V-6 engine. This advanced powerplant generates an estimated 365 horsepower at 5,500 rpm and 350 ft.-lbs. of torque at 3,500 rpm, resulting in significantly improved power, torque and fuel economy compared with larger, normally aspirated engines. This also is Ford's most powerful EcoBoost engine. The 3.5-liter EcoBoost V-6 also uses twin turbochargers, as opposed to a single unit. The reduced size of each turbocharger results in reduced internal inertia, allowing this advanced engine to avoid the "turbo lag" often prevalent in earlier-generation turbocharged applications. From the driver's seat, the rewarding result is linear power delivery across a broad torque band from 1,500 through 5,500 rpm. Peak torque building quickly off idle ensures responsive acceleration from a standing start. The new Ford Taurus SHO driveline combines a high-capacity six-speed 6F55 SelectShift transmission with a sophisticated torque-sensing All-Wheel Drive System. These components work in harmony to deliver ample traction when putting EcoBoost power on the road. The six-speed transmission offers a wide array of gears to enable spirited acceleration, yet comfortable high-speed cruising, through a 2.77 to 1 final drive ratio. SelectShift provides conventional automatic operation or a manual shift mode that gives the driver complete control over gear selection. For performance-minded drivers, paddle controls allow "match-rev" downshifts and will hold manually selected gears for precise control. Intuitively operated, a squeeze on either paddle will deliver an economical upshift under acceleration, while a gentle push forward brings a smooth downshift, synchronizing the engine and transmission speeds for responsive and positive engagement. The Ford Taurus SHO driveline is contemporized with the incorporation of a sophisticated All-Wheel Drive System that engages automatically and unobtrusively. The unit contains an advanced array of internal electromechanical clutches to efficiently distribute torque to the wheels with optimum traction. Standard all-wheel drive allows the Ford Taurus SHO to efficiently deliver its high performance to the pavement under a wide variety of conditions. "Taurus SHO suspension and steering have been sport-tuned to provide discriminating drivers with precise control, confident handling, communicative feedback and a compliant ride," said Pete Reyes, Taurus chief engineer. Ford Taurus SHO features an advanced electronic power-assisted steering (EPAS) system, providing responsive road feel and enhanced on-center balance while offering the additional benefit of increased fuel economy. SHO also features a sport-tuned suspension with unique shock absorbers, springs, stabilizer bars and strut mount bushings specifically developed and harmonized to deliver the highest level of Ford DNA road holding, cornering agility and steering responsiveness available in a Blue Oval full-size sedan. 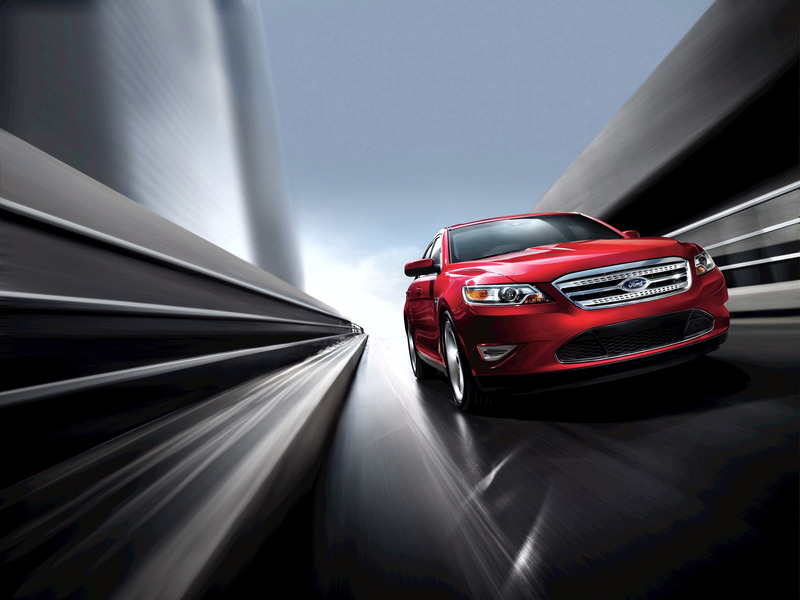 Ford Taurus SHO takes full advantage of the multi-link SR1 rear suspension design. Named for the 1:1 shock absorber ratio, this configuration provides an inherently stable baseline for the SHO development team to fine tune for enhanced driver control and agility. In addition, the SR1 rear suspension geometry provides increased travel, while enabling the use of 19- and 20-inch wheels and tires. For the discriminating automotive enthusiast, Ford Taurus SHO offers an available SHO Performance Package consisting of upgraded brake pads, recalibrated EPAS for even more responsiveness,a "Sport Mode" setting for the standard AdvanceTrac® Electronic Stability Control and a shorter 3.16 to 1 final drive ratio for faster acceleration. Summer-compound 20-inch Goodyear Eagle F1 performance tires on premium painted wheels also are included. "Taurus SHO was always a stealth high-performance car," said Earl Lucas, exterior design manager. 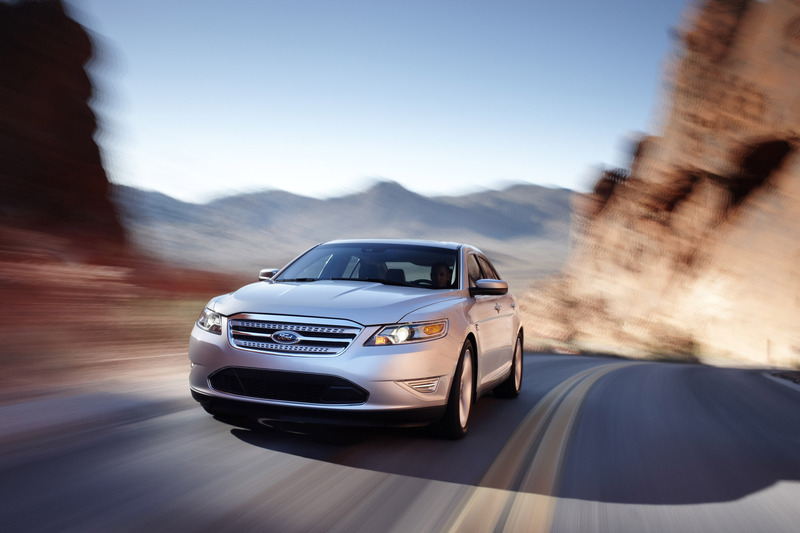 "The new SHO builds on the expressive design of the 2010 Taurus, adding subtle cues that set it apart." 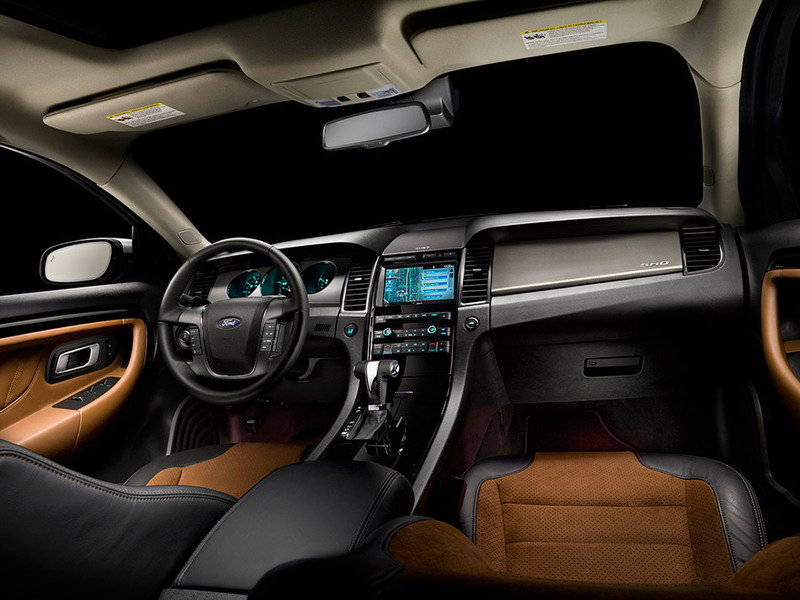 The new Ford Taurus SHO interior encourages performance driving. Leather-trimmed seats with Miko Suede inserts, made from recycled post-consumer yarns from plastic soft drink bottles, are comfortable and luxurious. A perforated leather-wrapped steering wheel puts the driver in smooth touch with the road. Front seats are 10-way power adjustable. SHO accelerator and brake pedals are trimmed in aluminum. The console, instrument and door panels feature SHO-specific authentic aluminum appliqués. SHO branding appears on the unique floor mats, and on the passenger side of the instrument panel. Ford SYNC® is the fully integrated, in-vehicle voice-activated communications and entertainment system standard on Taurus SHO. The system combines 911 Assist, Vehicle Health Report and GPS-based features including business search and call completion. SYNC connects to MP3 players, iPods, memory sticks and PDAs. The latest version of SYNC in the Ford Taurus SHO adds Traffic, Directions and Information, providing turn-by-turn route guidance and the capability to access and personalize content. Ambient Lighting allows the Ford Taurus SHO driver to program interior lighting from a choice of five soothing colors to suit any character or preference. 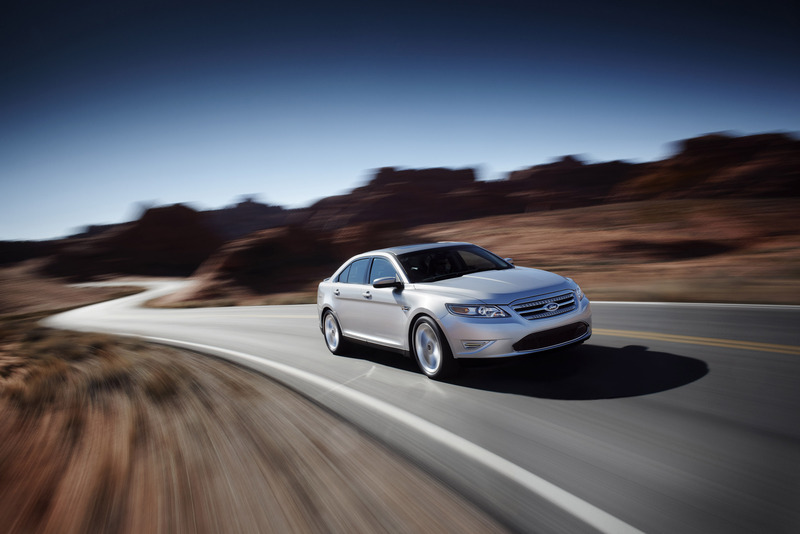 Adaptive Cruise Control, which allows the driver to set the Ford Taurus SHO cruising speed while using radar technology to monitor traffic travelling up to 600 feet ahead, automatically adjusting speed to help maintain a preset distance between vehicles. Adaptive Cruise Control comes with Collision Warning with Brake Support providing visible and audible warnings when slower traffic is detected ahead. Brake support is activated if the driver does not respond to provided warnings, and pre-charges the brake system to prepare the vehicle for stopping. Cross Traffic Alert uses existing BLIS radar modules to sense oncoming traffic while the Ford Taurus SHO is slowly backed from a parking space. When cross traffic appears within three car widths, the system provides a visible message on the instrument panel in combination with a sideview mirror warning and an audible signal. Multi-Contour Seats with Active Motion™ can be specified in conjunction with heated and cooled first-row positions in the new Ford Taurus SHO. Multi-Contour functionality provides subtle but continuous massage to help prevent back pain and fatigue and is ideally suited to meet the needs of long-distance drivers. 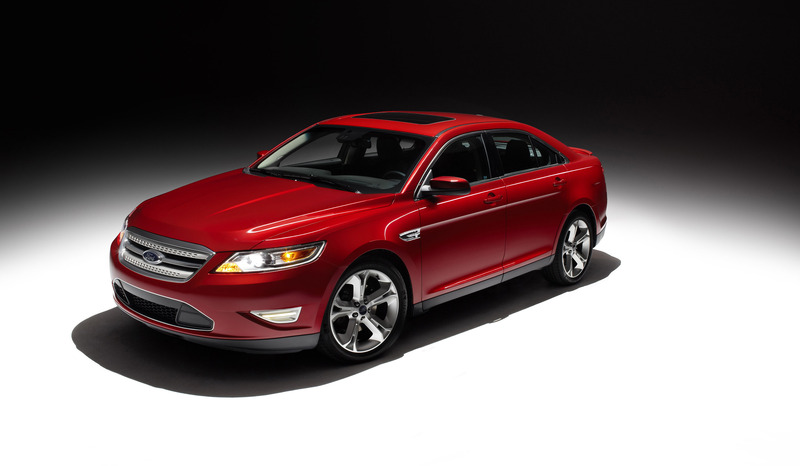 The 2010 Taurus SHO will be built at Ford's Chicago (Ill.) assembly plant and will be available in dealerships in summer 2009, starting at a base price of $37,995, including destination. Both known and loved for its high performance and unassuming exterior, Ford Taurus SHO was launched in limited production with only a five-speed manual transmission only for the 1989 model year. Introductory advertising positioned Ford Taurus SHO as putting "power in the hands of a fortunate few." Demand for the genre-defining Ford Taurus SHO was underestimated, as 15,519 units found homes with eager, enthusiastic owners in the initial model year. The closest performance comparison at the time was the BMW 528i, costing tens of thousands more than the SHO. Beyond significant performance capabilities, Ford Taurus SHO included features normally found on much more expensive cars such as ABS, Keyless Entry, a JBL audio system and sporty-yet-luxurious interior appointments. Two key factors made the original Ford Taurus SHO sedan a favorite of the automotive cognoscenti, right out of the gate. The critical element, a Yamaha-developed 3.0-liter V-6 engine delivering 220 horsepower, delivered thrust through a five-speed manual transmission. The SHO twist was design subtlety. Traditional American high-performance cars shouted their intentions with racing stripes, hood scoops and raised white letter tire sidewalls. Ford Taurus SHO was understated, stealth. From the V-8 Ford sedans from the '30s and '40s, the 1957 Fairlane 500 driven by Robert Mitchum in Thunder Road, through the mid-'60s Falcon Sprint, many Ford sedans offered unexpected performance in their price classes. A performance-minded customer of the day could specify a sleeper Ford sedan by shrewdly mixing and matching powertrain options and trim levels. 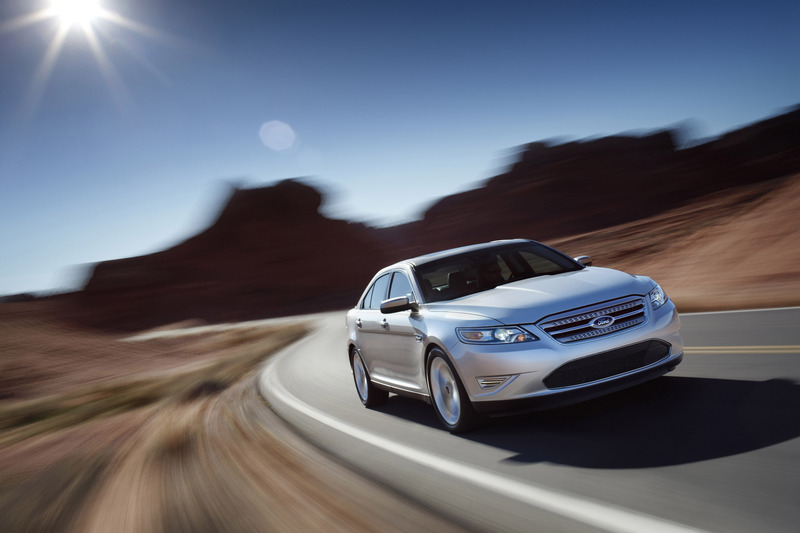 Until the Ford Taurus SHO arrived, this involved a special order and dealer-installed upgrades. 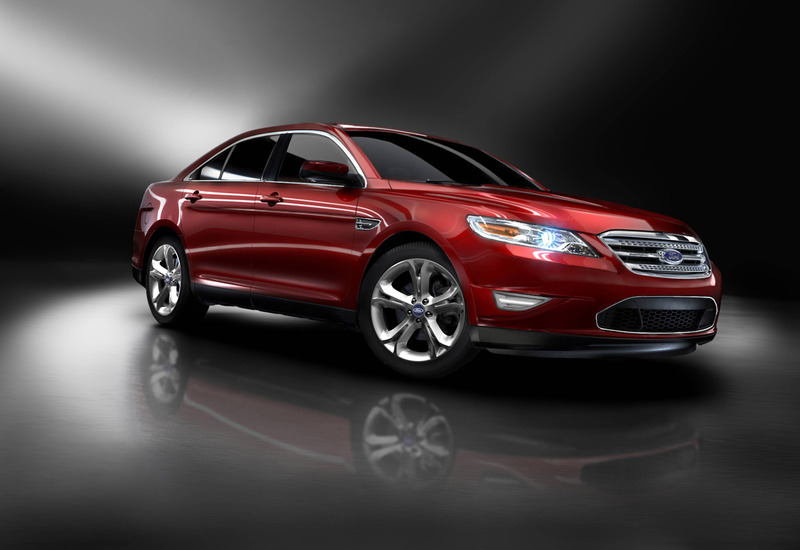 Ford Taurus SHO was an OEM interpretation of a time-honored hot rod recipe, to make the car faster than it looks. Automotive enthusiasts called the Ford Taurus SHO a "sleeper" as it delivered performance beyond the promise of its understated design. The December 1989 issue of Car and Driver reported a 0-60 figure of 6.6 seconds, a quarter-mile elapsed time of 15 seconds flat and an observed top speed of 143 miles per hour. To the untrained eye, the Ford Taurus SHO virtually was undistinguishable from the standard Taurus models, at that time the best-selling car in the United States. Ford Taurus SHO gave an enthusiastic owner the opportunity to blend in. A special-edition option package was launched for 1991, as some Ford Taurus SHO owners asked for aesthetic differentiation from normal Taurus sedan models. The Ford Taurus SHO was mildly redesigned for the 1992 model year but kept the subtlety. Comedian Conan O'Brien spoke frequently of his personal 1992 Ford Taurus SHO on his popular late-night talk show, adding to SHO lore. A four-speed automatic transmission was offered for 1993, dramatically expanding the number of potential SHO buyers. 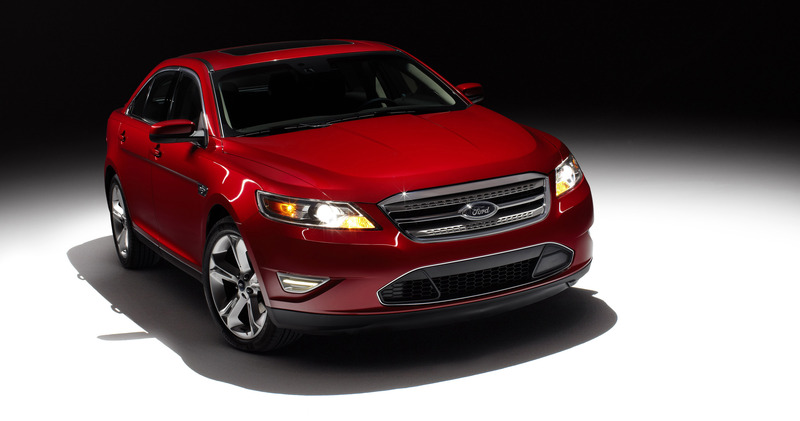 A record 21,550 Ford Taurus SHO models were sold that year. Ford Taurus SHO was redesigned for the 1996 model year, and given a Yamaha-developed 3.4-liter V-8 engine, coupled to a four-speed automatic transmission shared with other Taurus models. By the late '90s, Ford Taurus SHO sales began to taper off. Ford Taurus SHO production at the Hapeville, Georgia, production facility wound down at the end of the 1999 model year. During its 10 years, more than 100,000 were sold.